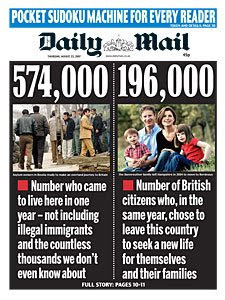 I generally despise the right-wing rag that is the Daily Mail, because of their partisan politics, rabid and irrational fear of immigrants, and constant criticism of the BBC; the Daily Mail is pretty much the print equivalent of Fox News - except the Daily Mail once supported facism and nazis. In fact, I would go so far as to claim that if you read the Daily Mail for understanding of today's political issues, I probably won't like you. The Daily Mail seems to constantly harp on about two issues: the BBC and Immigrants - i.e. "the BBC is rubbish nowadays" and "Britain is full of dirty immigrants nowadays, takin' our jobs and council flats!" Unfortunately, these are two issues (and stances) that I take personal offence to. If you've been fortunate enough not to be bombarded with the Jonathan Ross/ Russell Brand "scandal" of last week, all you need to know is that the Daily Mail is pretty much responsible for whipping up all the "outrage" from people who NEVER EVEN HEARD THE SHOW IN THE FIRST INSTANCE. So it's here at last. The dawn of the dumb has broken in earnest. Two mistakes occur - first Russell Brand and Jonathan Ross overstep the mark with an ill-advised bit of juvenilia, then someone decides to broadcast it. Two listeners complained, but that's by the by: it shouldn't have gone out. 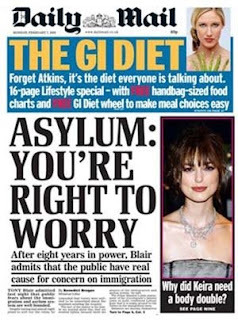 But then the Daily Mail - not so much a newspaper as an idiot's guidebook issued in bite-size daily instalments - uses the incident as the starting point for a full-blown moral crusade. Suddenly everyone's complaining, whether they heard the broadcast or not, largely on the basis of hysterical, boggle-eyed descriptions of what the pair said. Poor Andrew Sachs, who, having been wronged, graciously accepted their apologies and called for everybody to move on, looked bewildered by the sheer number of cameras stuck in his face. Because, by then, apologies weren't enough. I agree - the whole thing's absurd. People were only outraged about the Brand/Ross thing after the media told them they were supposed to be outraged. This has now been blown out of ridiculous proportion. As much as I felt it a bit for Andrew Sachs and his wife, I'm not that sure that the granddaughter being in a band called The Satanic Sluts felt as violated as she made out. I'm not sure how things are now developing but this just might be the career move from Heaven she's been waiting on. And as for Brand and Ross - eveyone knows their style. They rarely spare feelings and that exactly what they did here. Something they're normally renowned for. I will admit to reading the Daily Mail online but only because husband and I play Daily Mail bingo. I get points for any story involving a citizen being fined/imprisoned/flogged for puttin the wrong stuff in their recycling bin and husband gets points for any story involving a pensioner war hero being fined for ANYTHING. Our winning stories often overlap. Also, you cannot match the comedic value of the comments posted by readers. Awww, come on - you know there's just got to be something like this! Every culture must have its equivalent of Fox News!